AFSA Elections – Please Vote! Drop by AFSA’s Next Networking Happy Hour! Massachusetts: Retired FSO Larry Mandel met with international studies students at Northeastern University in Boston to talk about the Foreign Service and career options. Indiana: DeMark Schulze, a retired FSO, discussed life in the Foreign Service and the importance of being a global citizen at the University of Notre Dame. Texas: Retired FSO Molly O’Neal met with students at the University of Texas at Austin to explain the challenges and adventures of a life and career in the Foreign Service. These engagements, and all those like them, make a difference. 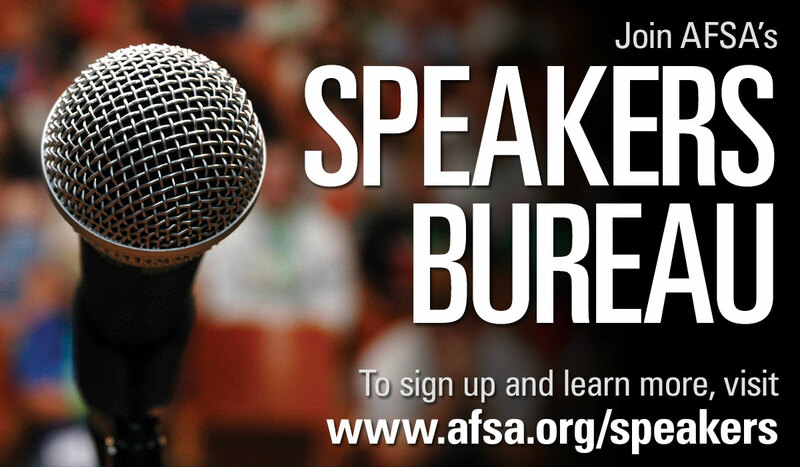 If you are interested in participating in AFSA’s outreach efforts, please join the AFSA Speakers Bureau if you have not done so already. In the past few weeks, we have had many expressions of support from members, and questions about how members can help at this crucial moment. We have also received expressions of support, sometimes effusive support, from many on Capitol Hill—from both sides of the aisle. For those of you who use social media, please go to AFSA’s Facebook page and “like” us. There is a compilation of quotes about the Foreign Service on our page. Feel free to use those quotes in emails, letters, and tweets. We also have the quotes on our Twitter account. Please re-tweet. Ask family members still residing in your home state to write their Members of Congress expressing support for the Foreign Service and the work you did during your career. Use this as an opportunity to talk to your family about that work and why it matters. If you or your family are active in a religious congregation, ask that prayers include “all those serving our country abroad” (whether in uniform or not). Finally, donate to the Fund for American Diplomacy! This is a great way to contribute, and all donations go towards increasing and enhancing AFSA’s public outreach and education efforts. Ballots for the 2017-2019 AFSA Governing Board election were mailed on April 17. Retiree members may vote for the officer positions (president, retiree vice president, treasurer, secretary) as well as the two retiree constituency representatives. A town hall meeting with candidates took place on April 4; you may watch the event on the AFSA website at www.afsa.org/video. 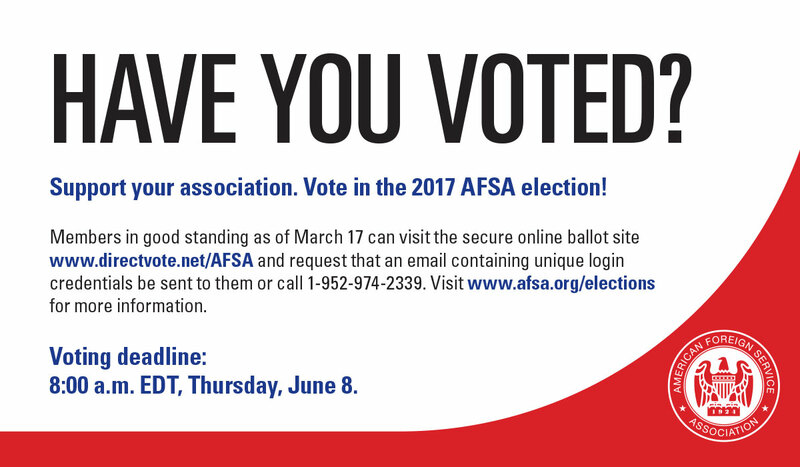 If you do not receive your ballot by May 8, 2017, please contact election@afsa.org and provide your full name, current address and telephone number. More information on elections is available at www.afsa.org/elections. First, any waiver of pension or survivor benefits by a spouse in a divorce decree must expressly reference the Foreign Service Act to be valid. Second, report any remarriage after a divorce within one year (FSRDS) or two years (FSPS), naming the new spouse as contingent beneficiary of any survivor benefit, even if the former spouse is already entitled to a survivor benefit. A contingent beneficiary is entitled to any portion of the survivor benefit not awarded to the divorced spouse in the divorce decree and 100% of the survivor benefit if the divorced spouse pre-deceases the annuitant or loses the survivor benefit by remarrying before the age of 55. Eligibility for a survivor benefit is also a requirement for a survivor to keep FEHB insurance coverage, whether or not they ever actually receive a survivor benefit. Notify State’s Office of Retirement at HRSC@state.gov or call 866-300-7419 to report any changes in your marital status. In case you were unable to attend our March 2 event on Social Security with subject matter expert Ed Zurndorfer, we are pleased to make it available to our members for online viewing. Simply visit www.afsa.org/video to watch the program, or any other AFSA program that may be of interest to you. For a brief summary of the program, click here. This year’s recipient of AFSA’s award for Lifetime Contributions to American Diplomacy is Ambassador (ret.) Nancy J. Powell. She is being honored for her inspirational 37-year Foreign Service career and her endless dedication to mentoring new generations of Foreign Service and Civil Service colleagues. 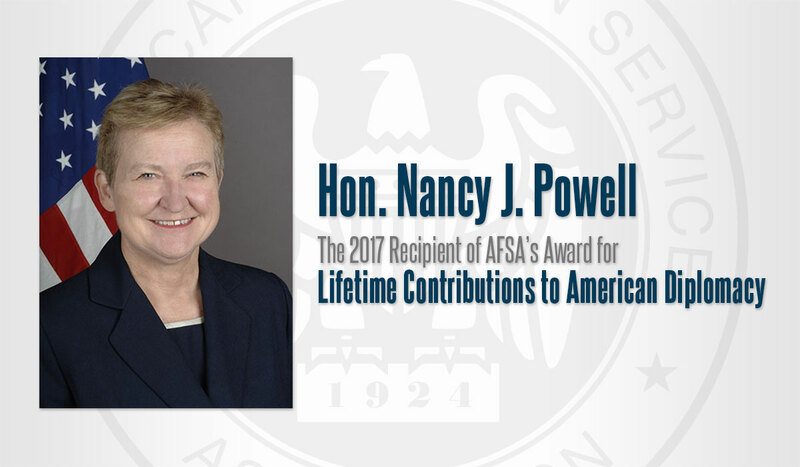 Read more about Ambassador Powell at www.afsa.org/lifetime, and join us for the annual AFSA awards ceremony on June 20 at 4:00 p.m. in the Benjamin Franklin Room at the Department of State. 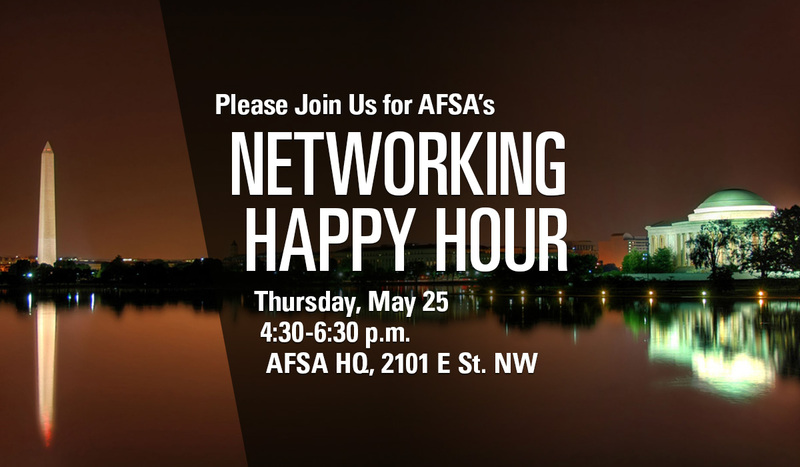 Please join us at AFSA’s next networking happy hour on May 25 at 4:30 p.m.—to catch up with old friends, connect with new colleagues, and share stories and survival tips with fellow members of the FS family. Non-alcoholic beverages and light snacks will be served; $5 drink tickets for wine and beer will also be available. You may register online or email events@afsa.org. We invite all retirees to join us for the annual Foreign Service Day reception at AFSA headquarters following the end of the official programs at the Department of State. Please stay tuned for a separate announcement for this reception.